The El Niño-Southern Oscillation (ENSO), the disruption of normal east-to-west atmospheric circulation and ocean conditions that originates in the Pacific, is well known for its drastic effects on present-day climate. However, its role in paleoclimate and its long-term effects are not as well understood. Now, two papers published independently of each other in the July 12 issue of Science suggest evidence for ENSO as far back as the Pleistocene. Contrary to earlier ideas, they suggest that El Niño phases actually occurred in glacial times and global cooling rather than during interglacial periods. 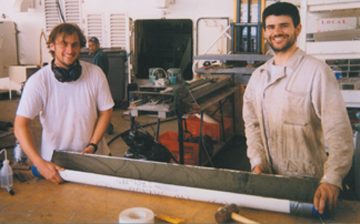 Two shipboard technicians hold a section of one of the sediment cores collected in the western Pacific off the coast of Indonesia. Image courtesy of Lowell Stott. The results were very unanticipated, says Lowell Stott from the University of Southern California, lead author of the study conducted in the western Pacific. Athanasios Koutavas from Lamont Doherty Earth Observatory, lead author of the study conducted in the eastern Pacific, admits the same: The leading climate hypotheses suggest the opposite is true. Researchers observe present-day El Niños when global warming is evident. These surprising results emerged from studies that were focused on investigating the role of the tropical Pacific in paleoclimate, and attempting to determine a recognizable relationship between paleoclimates in the tropics and those in the high latitudes. Stott and his team collected cores from the warm waters south of Mindanao in the Philippines. Koutavas and his colleagues collected cores in the cold tongue of the equatorial eastern Pacific, off the Galápagos Islands. Both studies looked at planktonic foraminifera (forams), single-celled organisms whose fossil calcite shells are excellent tools in reconstructing past climate. Calcium-magnesium ratios and oxygen isotopes of the forams helped the teams to determine past sea-surface temperatures. The interesting thing is that the studies show the east and west Pacific temperatures are doing what Pacific temperatures in present El Niños do, says Amy Clement, a climatologist at the University of Miami who models El Niño events. Koutavas and his team were able to detect El Niño events by comparing their determined temperatures with other published paleotemperatures from neighboring sites. Although the paleoclimate data for the ocean as a whole suggest cooling, they found that the cooling in the cold tongues during glacial periods was much less than in warm Pacific waters. Thus, the difference in cold eastern Pacific and warm western Pacific waters was reduced, as happens during present-day El Niños. Stotts western Pacific study used foram oxygen isotope data to determine temperature variations and surface water salinity. Surface salinity is highest when precipitation is lowest. Present-day El Niños reduce rainfall in this region, thus increasing surface salinity. Analogous high salinity in the paleorecord point to El Niño patterns in the past. That El Niño events could have existed in the past is not what surprised the researchers. What surprised them was that these events seemed to occur during glacial times. The temperature variations from the tropical Pacific distinctly correlate with glacial-interglacial temperature variations recorded in ice cores. Stotts team sees similarities with the Greenland ice core, GISP2. Koutavas team finds that, along with GISP2, the Antarctica Byrd ice core matches their record. The reliable age dating allowed both papers to show that changes in the sea-surface temperatures of the equatorial Pacific actually occur shortly before the temperature changes observed in ice cores during periods of deglaciation. Glacial terminations are abrupt, solar variation is slow, and scientists have struggled and continue to struggle to understand causes for such rapid glacial disintegration, Stott says. Their work suggests that dynamics of the equatorial Pacific were probably influential in halting global ice growth. Clement advises caution, We dont know what controls the mass balance of the ice sheets in the long term. The present-day effects of ENSO on ice balance are still unclear. Both Stott and Koutavas understand this caution. There must be, and presently we are working on other cores to show if the pattern holds. Its extremely important to try and model this and see if modelers can prescribe El Niño-like conditions, Koutavas says.